For use on your buffing machine! 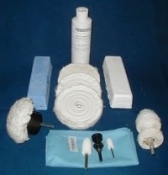 The Abrasive Wheel System comprises of a special adhesive, and an aluminum oxide powder, (your choice from the option list), and a spiral sewn cotton wheel. Once the adhesive has hardened on your wheel, the wheel is transformed into a tough, yet somewhat flexible grinding wheel, capable of grinding of plating, paint, rust, and smoothing out all metals. The system is ideal for making felt bobs more abrasive. Using a knife or spatula, the thixotropic adhesive is spread evenly around the face of your wheel. Finally, roll the wheel into the abrasive using light pressure, ensuring a heavy pickup of the abrasive. 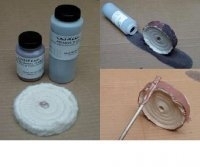 Leave the coated wheel to air dry for several hours prior to use (overnight is ideal). Subsequent applications will provide a longer lasting system. Gentle heat from an oven will speed up drying times considerably. As the system wears off, the wheel may be retreated numerous times. AVAILABLE IN 4", 6" or 8" For use with a drill and adaptor or on a bench machine with a spiral adaptor. •1 x Spiral Sewn Cotton Wheel, chose your size and centre type below. This hard center is heavy duty industrial grade. For use with tapered spindles. Traditional hole cut in the center, to suit clamp style adapters.